Tran Luong is the co-founder of Nha San Studio. ​Tran Luong’s practice spans painting, installation, and performance art. The artist came to international prominence as part of a group of artists called the Gang of Five, and was responsible for leading the development of contemporary art in Vietnam in the late 1980s and early ’90s. 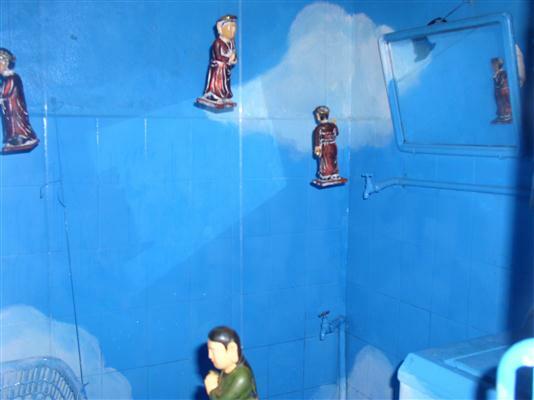 Tran Luong is a key player in advancing critical contemporary art in North Vietnam. He creates innovative new media artworks, has founded numerous spaces for alternative art and collaboration, and mentors a new generation of artists in a context of censorship and cultural conformity. Selected recent exhibitions include: ‘No Country: Contemporary Art for South and Southeast Asia’ at Guggenheim (New York, USA) and Centre of Contemporary Art (CCA), Singapore, 2014; ‘Medium at Large’, Singapore Art Museum, Singapore, 2014; ‘Welcome to the jungle/ Welts’ at Yokohama Museum of Art & Contemporary Art Museum Kumamoto. Japan, 2013; ‘The Future of Imagination 8′, Singapore, 2012, vv…. His works are in the collection of major museums such as Solomon R. Guggenheim Museum (New York, USA), Singapore Art Museum (Singapore), Fukuoka Asian Art Museum (Japan). He has curated and co-curated numerous exhibitions inside Vietnam and also internationally.